Welcome to the Romsey Youth Choir (RYC) website. Romsey Youth Chamber Choir – for older more experienced members. RYC has a membership of around 100 singers. Each year the choirs perform in around 15 concerts or festivals. We’ve taken part in the Mid-Somerset Festival in Bath, Southampton Festival of Music and Drama as well as concerts and performances in Lymington, King Somborne and Winchester Cathedral. However, the home venue for the choir is Romsey Abbey where we have our Christmas and summer concerts as well as taking part in other local joint concerts for the community. Many of these concerts were fund-raising events for a variety of the charities (Jane Scarth House, Naomi House Hospice, Oxfam, Cancer Research and the other local charities). Our own Christmas and summer concert in the Abbey are hugely enjoyable and provide the main funding source for the running of the choirs. 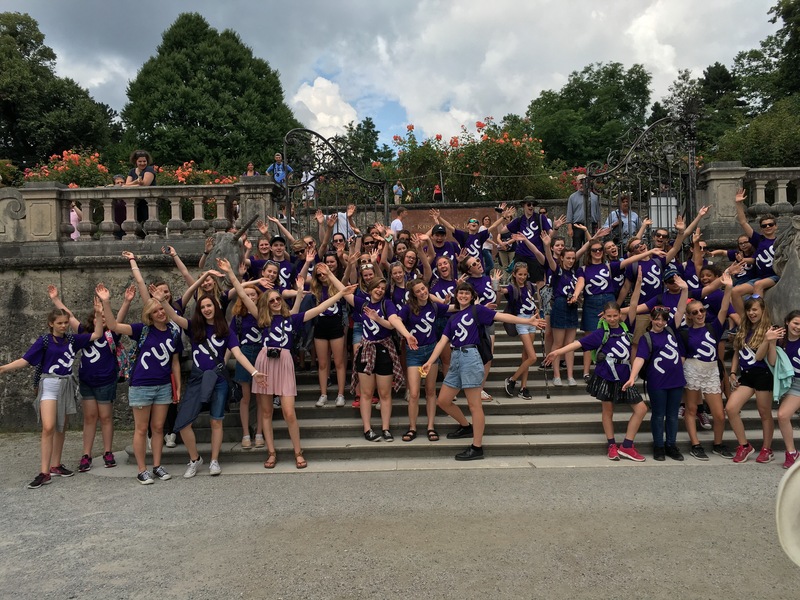 Since 2013 the RYC has gone on a summer tour and has performed in great venues such as the cathedrals in Barcelona (Sagrada Familia), Enniskillen, Cortona and Bayeux as well as open air concerts at the North American cemetery in Normandy, the sculpture park amphitheatre in Siena and the lakeside pavilion in Zell am See. The reports on previous tours can be found in the Tour Page. In 2018 we went to The Netherlands and Belgium, staying outside Amsterdam and will be visiting Amersfoort, Amsterdam and Efterling before staying in Bruges and the singing at the Menin Gate, Ypres. In 2019 we are planning our tour of Transylvania. Romsey Youth Choir was formed in October 2010 and since then we have produced cup winning performances at Bath, Southampton, Portsmouth and Bournemouth Music festivals. We have performed with the South Wales Male Voice choir “Cor Meibion de Cymru”, Romsey Male Voice Choir, Romsey Concert Band as well as local solo performers. In 2018 we took part in Hampshire Music Service events in the Royal Albert Hall and the Anvil, Basingstoke – see our posts for more details. We also have a thriving social agenda which includes theatre trips, ice skating, quiz evenings and an end of year BBQ.